Happy first day of summer! Could there be any better way to celebrate this day than with summer rolls?! 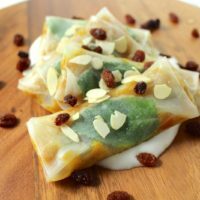 While they already are the perfect summer food, as they’re usually filled with fresh vegetables and eaten cold, with a sweet apple ginger filling theses summer rolls become the perfect sweet treat for the hot season. It really tastes like dessert, more precisely like a combination of apple strudel and apple turnovers, while the ingredients are actually healthy. 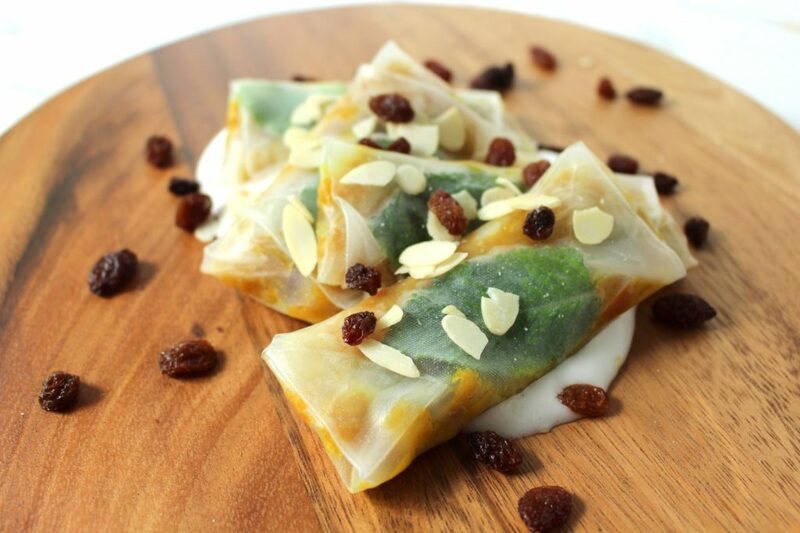 You could even have these sweet summer rolls for breakfast without doubt. Serve with a sweet foam made of chickpea water (yes, the liquid that’s left in a can of chickpeas when you make hummus) for that extra wow. Be sure to reveal the ingredients after serving – nobody will ever know! Another great variation would be one with a coconut rice pudding filling. Simply add some fresh fruit and you have a great breakfast/ snack for on the go. Place diced apples and ginger into a pot with coconut oil (if using) and stew for about 5 minutes. Add turmeric, cinnamon and sugar. Cook for 3-5 more minutes until soft. Mash apple mixture with a fork, potato masher or immersion blender until smooth. Mix in lemon juice and raisins and set aside. In the meantime, prepare the sweet foam: Whip chickpea water (aquafaba), using a hand mixer for about 3 minutes (just like you would whip egg whites). Add powdered sugar, one tbsp at a time, and keep whipping until it has reached your desired sweetness and a rather firm foam. Finally mix in vanilla. Fill a plate big enough to fit the wrappers with lukewarm water and dunk one in for a few seconds until it's pliable. Place flat onto cutting board. 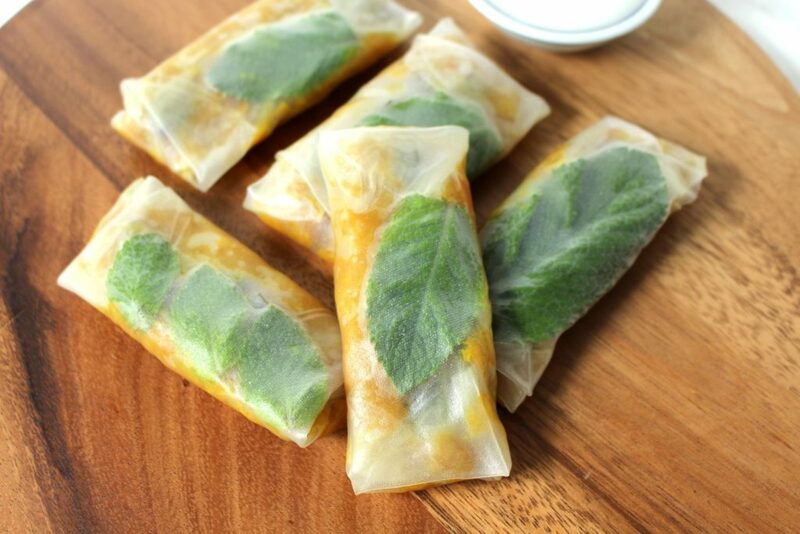 Add about 1 tbsp of apple mixture to the middle of the wrapper and place a mint leave right above it (optional) and start rolling (click here for step-by-step instructions). Serve as you like, e.g. 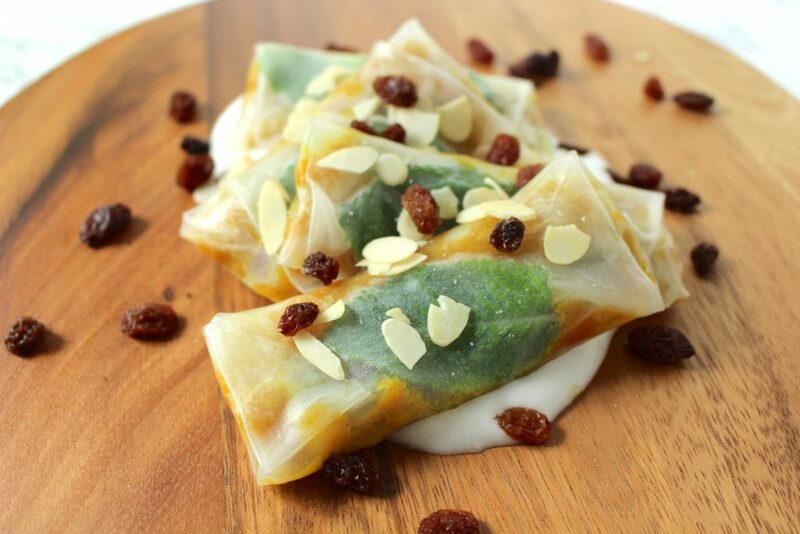 with sliced almonds, raisins and sweet foam. If you serve these summer rolls with the sweet foam, you may not need to add too much sugar to the apple mixture. However, that's a matter of taste - I don't add any sugar, because to me apples are sweet enough on their own already. You can find more information about the miraculous ingredients named "aquafaba" in my recipe for vegan french toast or the one for chocolate chip cookies. You can find a step-by-step tutorial on how to roll summer rolls here. I hope you love this recipe – please let me know in the comment section below! If you make these sweet summer rolls, make sure to take a photo and share it on my Facebook page or on Instagram, using the hashtag #minamadefood. Oh and don’t forget to tag me (@thisisminamade) so that I can see your creations!